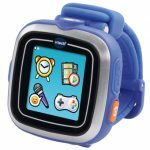 The VTECH Kidizoom is a smartwatch for kids, aged 6 to 12. It features a 1.4-inch color touchscreen display, with up to twenty different watchfaces for kids to swap out. In addition, it includes a camera with video recording support, a voice recorder, and three educational games. A USB port allows parents and child to transfer photos and videos to a computer. It's even pre-loaded with several child-themed games that your munchkins can play on the go - great for those long car rides!